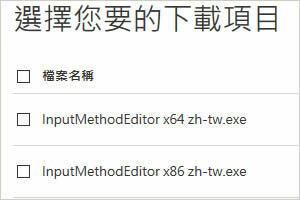 Q: Is there a way to update/upgrade/repair my Microsoft Traditional/Taiwan/HK IME? and despite its name does not require you to own Microsoft Office! 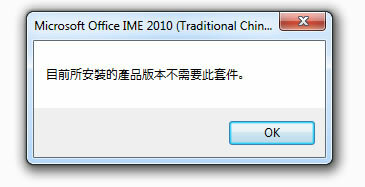 This free update is called "Microsoft Office 輸入法 2010" but does not require any version of Office installed. This is for Windows 7, Vista and XP SP3 and - I repeat - does not require Office. It will install on both 32-bit and 64-bit systems. New Quick 2010, a keyboard overlay a bit like Cangjie. In Windows XP you must enable East Asian languages. In Windows 7 and Vista, East Asian languages are enabled by default. Install this update after Language Packs / MUI Packs for Windows or Office to avoid replacing this update with older IME files. On the next page, select the appropriate version for your system: x64 for 64-bit systems, or x86 for 32-bit systems. After you download the file, double-click, install and you're done...unless you get an error message. Someone at Microsoft keeps releasing IME update installers that look for Office on your system. I think Office is distributed in Chinese markets with Chinese language packs containing the latest IME updates, and so if it sees Office the installer assumes you already have the update. I got them to fix this once in the Taiwan/HK IME updater, but now it's back - in both the Taiwan/HK and mainland/Singapore versions! If you have Office 2013, you may see a different error about missing IME64.cab or IME32.cab files. Restart your PC if you don't see the updates in your Language Bar/band after installation. I did see them immediately, but this is always a good idea after any system-related installation anyway. FAQ: How do I get the "candidate list" to appear in the MS New Phonetic IME? FAQ: How do I resize the MS New Phonetic IME Candidate List? And have you updated your PRC IME? Please see the MSPY 2010 Pinyin IME Update FAQ for more information. Works in Windows 7, Vista and XP SP3 with or without Office.